With Christmas around the corner, it is important to remember not everyone has a Happy Holiday season. This Christmas four Atascosa families are still searching for their loved ones. Missing from the county are Greg Cisnero, Michelle Longoria Villarreal, Eric Garcia and Ramiro Garcia. Nobody just disappears, but that’s exactly what has happened to Charlotte resident Ramiro “Ram” Garcia. The father of four has been missing since September 1. Since Ramiro disappeared his family has actively searched for him, looking in ditches, along the sides of roads and in every field they pass to no avail. According to family Ramiro had no enemies and family meant everything to him. The Charlotte man and his wife have been together for 24 years, married for 21. The couple has four children together. The older two, Brianna, 21, Nathaniel 19, a senior at Charlotte High School and the younger two, Ethan 7 and Izabella 5. They are a close knit family, with Ramiro being the baby of seven. 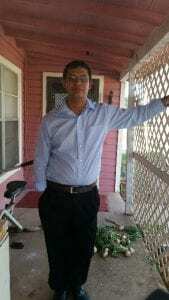 Today his wife, children, parents Mary Helen and Nicanor Garcia and his brothers and sisters, Henrietta Cantu, Jessica Cruz Ferrell, Connie Cordova, Becky Ramos, Nick Garcia and Jaime Cruz are all at a loss. They are left to mourn and wonder. They search to find an answer. With so many possibilities, it’s hard to pin down a conclusion. What they do know is that a huge part of them is missing. True, the last few months Ramiro was acting differently. He seemed fidgety and scared. Was Ramiro using drugs? Was he having a mental breakdown? They know he had begun counseling and had made three visits before his disappearance. The day he disappeared Ram had lunch with his wife and mother-in-law in Pleasanton. He wasn’t himself. He once again appearing nervous and antsy. He said he needed to run some personal errands and called in to his job at Golden Chick to let them know he would be late. He told his wife he needed to meet with someone and they discussed touching base at their home when he was done. He didn’t tell her who he was meeting. Kristina and her mother went to the store and then she went home. Ram called Kristina at 1 p.m., he told her he had a bad feeling and that if anything happened please tell the kids he loved them. That was the last time Kristina Garcia heard the voice of her husband of 21 years. She tried to contact him a few times but he didn’t reply. Her day was full with the after school rush so she was sidetracked. At first she thought he didn’t reply because he was busy at work, but as the evening wore on she became concerned. They were a couple in constant contact. They would call and text constantly throughout the day, why wasn’t he replying? As the hours passed she grew more concerned. From 10 p.m. to 8:30 a.m. she tried to contact him non-stop. As morning came Kristina contacted the Sheriff’s Department. Ram has never stayed out all night. Within about 15 minutes the authorities informed Kristina they had located his car on a private road in the rural community of Bigfoot. It was thought to be an abandoned car and the property owners reported it as soon as they saw it. That was about 5 p.m. the day Ramiro disappeared. In the span of 4 hours Ramiro was gone. A family hurts and prays thinks and waits for answers. Memories are what the family clings to. They remember the son, father and husband that he was. Up until September 1 not a day passed that he didn’t visit with his parents. Ramiro was the type of father who attended school functions and played with his children. He enjoyed having family and friends over to the house. His family mourns this Christmas. But what are they mourning? It is a mystery. Is he alive, lost somewhere? Did he make someone angry? Is he dead? Where is Ramiro Garcia? 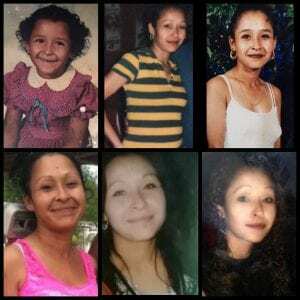 The last time Michelle Longoria Villarreal was seen she was walking along FM 173/ FM 2146 a few miles outside of Jourdanton. Her boyfriend said he dropped her off. He said that she was planning on going back to her husband in San Antonio. Neighbors saw her walking but didn’t think anything of it. That was the last time Michelle was seen, February 5, 2014. Three years of missed birthdays, Thanksgiving and Christmases. This year her oldest daughter, Chelsea graduated from Charlotte High School. Michelle was so proud of all of her kids, she would have never willingly missed her daughter’s graduation. She encouraged Chelsea to stick with it and get her diploma, something she hadn’t accomplished herself. Michelle’s four children have lived with their grandmother Rachel Longoria off and on most of their life, but no matter, their mother was in contact with them. She didn’t go a day without contacting her family and checking on her children. That’s why they knew things were off when they couldn’t get in touch with her and she didn’t call. The children, Chelsea, 19, Jonathan, 14, Jenaya, 9 and Jerediah, 6, miss their mother, but press on, often hiding their pain. They have good days and bad days. Typical of the oldest child Chelsea holds it together most of the time. And typical of a teenaged boy Jonathan has found ways to cope quietly with his pain. Jenaya is an artist and a writer. She wrote her mom letters every day for the first year she was missing. The youngest, he cries for her every day. He talks about his mom all the time, remembers the smallest details about her. Her smell, her laugh, her cooking. And what will never be forgotten about Michelle was how trusting she was. She always had a smile. She liked to joke around and had no enemies. Her family and friends have spent every spare minute searching brush, ditches and roadways hoping to find some hint of Michelle. Leads turn into dead ends. Without a body, the police can’t do much. So the family, much like the families of the other three missing Atascosa County residents, spend time thinking, wondering, praying and hoping. What happened to Michelle? Will they ever bring her home? When will any of them ever make it home? Editor’s Note: If you have any information about either of these missing persons please contact the Sheriff’s Department at 830-769-3434. “Both investigations are considered ongoing criminal investigations that are actively being worked.” Sheriff David Soward. Crime Stoppers offers rewards of up to $5,000 for information leading to the arrest or indictment of anyone who commits a felony, you may call 830-769-2255 with information.